Transform a storebought sweatshirt with set-in sleeves into an elegant, semi-fitted jacket with curved hemline. 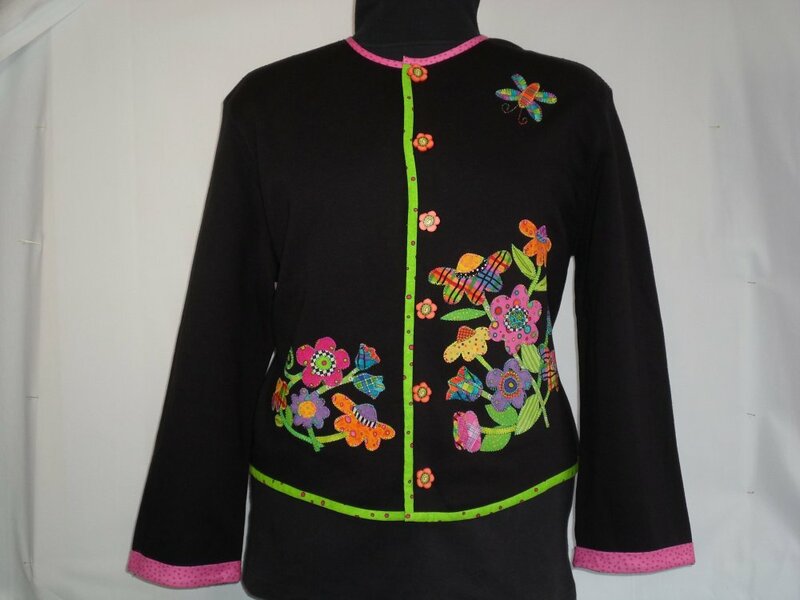 Iron-on appliques made from bright fabrics decorate the front of this cozy jacket you'll love to wear. A few simple changes and the sweatshirt gains a figure-flattering shape. If you're tired of saggy, ill-fitting sweatshirt jackets, this is the pattern for you! You won't believe it's a sweatshirt, it looks so elegant! All sizes included, XS-XXL, 4-26. BUTTONS available: 6 handmade orange flowers. KIT includes pattern, handmade buttons and a selection of similar bright fabrics for applique and trim. Kit does NOT include notions or sweatshirt with set-in sleeves.